2018 TOUCHWOOD IS NO LONGER TRADING. THE AQUILEGIA COLLECTIONS ARE DEAD FROM THE KILLER DISEASE AQUILEGIA DOWNY MILDEW. These pages are left for information and historical reference. 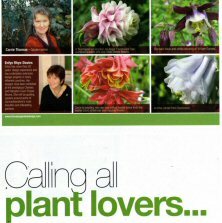 GREAT NEWS: The National Collections of Aquilegia were on TV: Gardeners' World 30th May 2014. 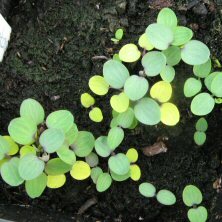 UNHAPPY NEWS: there is a new disease of aquilegias: downy mildew which is threatening the Swansea National Collections. QUICK LINKS: Click pictures below or scroll down for further information. for English captions select 'subtitles', it is the 2nd icon, bottom right. TOUCHWOOD holds the TWO National Plant Collections of Aquilegia. In recognition of the incredible golden doubles (known as 'Touchwood Treasures') that are being created here, Plant Heritage (was NCCPG) granted Plant Collection status in Autumn 2009 for 'Aquilegia hybrids'(adding to the existing 'Aquilegia vulgaris cultivars'). They flower a little later than the A. vulgaris cultivars, so extending the season. The Gardeners' World, or Byw yn yr Ardd features on TV could be thought of as trailers for my 90minute DVD/video in which I tell you more than you thought there was to know about Aquilegias! Includes demonstration of sowing and growing, pests and breeding your own plants. Many, many named forms, and other cultivars are shown. If you want to buy seeds: for something different, try the Touchwood seed-list (including vegetables), and the Aquilegia seed-list. The seeds are of unusual, rare and cottage garden plants. You will find an incredible range of aquilegia seeds for sale. Or do you need sowing information? Or perhaps general encouragement or ideas about what's available from seed? If so, then these articles will help to inspire. "The service and help you offer is exceptional, and, once again, many thanks"
Postal service: If you wish to buy plants during the winter and early spring, you can order bare-rooted plants. You can also buy Aquilegia plants after flowering in June (they respond well to cutting back at that time of the year). Also, in spring and summer I offer a very popular service sending out young seedlings. More information on these services can be found under Plants. I always have plenty of plants for sale at Touchwood, either at the garden, or in rare plant sales. Visit the garden to buy.......in May and early June there are hundreds of Aquilegias available whilst flowering. I also bring plants and seeds to sell when I give gardening talks. If you would like to receive information and offers 4x a year by e-mail, please e-mail me and I'll be happy to add you to my e-mailing list. 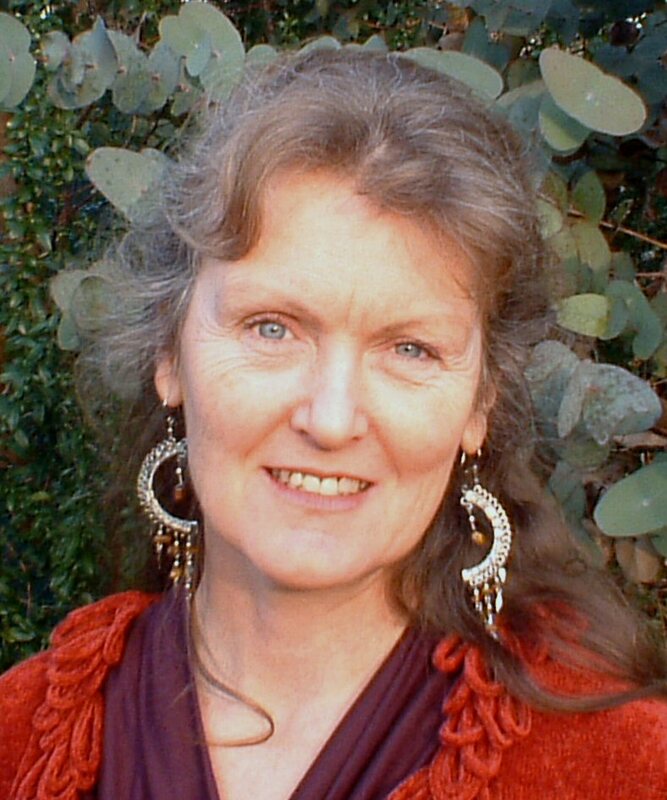 Over 20 different talks given on a wide subject range within gardening, wildlife and botany. The garden at Touchwood, Swansea, is open during the gardening year. Understandably it is most popular whilst the aquilegias are flowering in May and early June, but there's always plenty of interest. May not open in 2015. Very beautiful original flower-photo cards are available. Wedding favours: special seeds for your special friends on your special day! DVD A Guide to Aquilegias: Sowing, growing and breeding. This is the ONLY DVD available on Aquilegias. It should tell you EVERYTHING you need to know, whether that's getting started or developing further, through cross pollinating, for example. Fragrant smudge sticks to cleanse and clear. Quality labels and pens for your gardening needs. Finally: quick quiz question follow the link to see if you are right! WHAT ON EARTH IS THIS ARRAY OF LETTERS? What's it to do with Touchwood Plants? So if you are looking to buy plants or buy seeds of unusual, rare and cottage garden plants, then you've found the right site. And if you want to buy aquilegia seeds or plants you will be in heaven! I sell seeds all year round and sell plants when appropriate depending on their growth. Copyright Carrie Thomas 2013. All rights reserved.